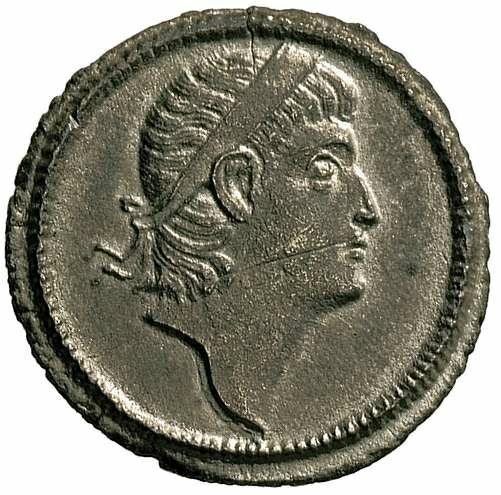 Flavius Dalmatius was a Caesar of the Roman Empire, and member of the Constantinian dynasty. Dalmatius was the nephew of Constantine I. His father, also named Flavius Dalmatius, was the half-brother of Constantine and served as censor. He was the brother of Hannibalianus. On 18 September 335, he was raised to the rank of Caesar, with the control of Thracia, Achaea and Macedonia. Dalmatius died in late summer 337, killed by his own soldiers. It is possible that his death was related to the purge that hit the imperial family at the death of Constantine, and organized by Constantius II with the aim of removing any possible claimant to imperial power other than the sons of the late emperor. Reverse: GLOR-IA EXERC-ITVS / two soldiers holding spears & shields with one standard between them, O on banner. SMANI in ex.